Coaches are our favorite people! You help promote speech and debate, the best activity to train up the next generation of speakers and debaters. The following downloads release through the end of the calendar year, all meant to help kick off the competitive season for your students. Coaches Release #34: “Parli” (4/8/2019)- This week’s Monument Coach Release is the current release for parliamentary debaters. Coaches Release #33: “Stoa LD” (4/1/2019)- This week’s Monument Coach Release is the current release for Stoa Lincoln-Douglas debaters. In this release Author Chris Jeub presents an affirmative case on egalitarianism. 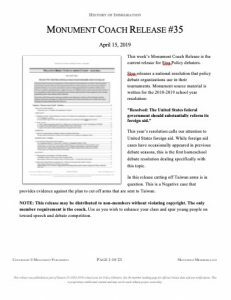 Coaches Release #32: “NFHS Policy” (3/25/2019)- This week’s Monument Coach Release is the current release for NSDA Policy debaters. Coaches Release #31: “NCFCA Policy” (3/18/2019)- This week’s Monument Coach Release is the current release for NCFCA Policy debaters. Coaches Release #30: “Extemp” (3/11/2019)- In this release author Chris Jeub reviews the current trade war between President Trump and China. The most useful part of these downloads are the practice questions for Extemp students to use in their practice. Coaches Release #29: “NCFCA Apologetics” (3/4/2019)- In this release author Joshua Johnson covers the Grace of God in depth, providing Bible verses, quotes, citations, and analysis from an Apologetics champion. Coaches Release #27: “Stoa Lincoln-Douglas” (2/27/2019)- This week’s Monument Coach Release is the current release for Stoa Lincoln-Douglas debaters. Monument source material is written for the 2018-2019 school year resolution: “Criminal procedure should value truth-seeking over individual privacy.” In this release author Nathaniel Arroyave takes on the popular application, Carpenter v. United States. Coaches Release #28: “NFHS Policy” (2/25/2019)- This year’s resolution calls our attention to legal immigration into the United States. Though much of the controversy deals with illegal immigration (building a wall, stepped up deportations), this resolution only allows us to change the rules to increase legal immigration, leaving illegal immigration changes extra-topical. In this release authors Vance Trefethen presents a second affirmative brief on open immigration policies. Coaches Release #24: “Stoa Policy” (1/28/2019)- In this release PEPFAR is in question. This is an Affirmative case provides evidence for the plan to increase funding towards this industry which provides campaigns to fight against HIV/AIDS in other countries. Coaches Release #23: “Parli” (1/21/2019)- This week’s topics of debate include the New England Patriots, Israeli strikes in Syria. China’s war on pollution, autonomy to Bangsamoro, the shutdown, Turkey’s security ability, and migrant aid. Coaches Release #22: “Stoa LD” (1/14/2019)- In this release author Steven Errico takes on neither Affirmative nor Negative, but instead focuses on one application that will be popular throughout this year. Coaches Release #21: “NFHS Policy” (1/7/2019)- In this release authors Vance Trefethen presents an affirmative case on the US resettlement policies for the oppressed people called the Rohingya. Coaches Release #20: “NCFCA Apologetics” (12/17/2018)- This week’s Monument Coach Release is the current release for NCFCA Apologetic students. Coaches Release #19: “Stoa Lincoln-Douglas” (12/10/2018)- In this release author Jascha Ely-Halliwill writes from the aspect of justice, arguing that this value is the best way to affirm the resolution because if one is seeking truth then they are also seeking justice. Coaches Release #18: “Stoa Policy” (12/3/2018)- In this release the U.S. Military Aid to Egypt is in question. The Affirmative case was last week’s release which planned to cut military aid to Egypt. This is the Negative brief that argues that cutting military aid to Egypt would be a bad idea. Coaches Release #17: “Platform” (11/26/2018)- This week’s Monument Coach Release is the current release for Platform speeches. Coaches Release #16: “Parli” (11/19/2018)- This week’s Monument Coach Release is the current release for parliamentary debaters. Coaches Release #15: “Interp” (11/12/2018)- As a coach, you can use this source material to enhance your understanding of Dramatic Interpretation. This speech is an excellent example of champion speaking. You may want to consider this event for your students in Season 19. Coaches Release #14: “Stoa Lincoln-Douglas” (11/6/2018)- In this release author Alisa Stringer debates from the aspect of a “all truth, all privacy” stand point, arguing that valuing liberty is the best way to affirm the resolution. Coaches Release #13: “NFHS Policy” (10/29/2018)- In this release authors Vance Trefethen and takes on a 2nd Affirmative side of the case H-2A Visa reform. 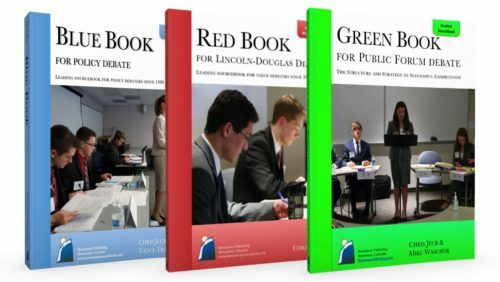 Coaches Release #12: “NSDA Lincoln-Douglas” (10/22/2018)- This week’s Monument Coach Release is the current release for NSDA Lincoln-Douglas debaters. Coaches Release #11: “NCFCA Policy” (10/15/2018)- This week’s Monument Coach Release is the current release for NSDA Policy debaters. Coaches Release #10: “Extemp” (10/8/2018)- This week’s Monument Coach Release is the current release for Extemporaneous competitors. Coaches Release #09: “NCFCA Apologetics” (10/1/2018)- This week’s Monument Coach Release is the current release for NCFCA Apologetic students. 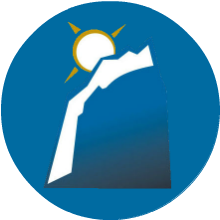 Coaches Release #08: “Public Forum” (9/24/2018)- This week’s Monument Coach Release is the current release for NSDA Public Forum debaters. Coaches Release #07: “Stoa Lincoln-Douglas” (9/17/2018)- In this release authors Micah Chapman debates from the aspect of a social contract, arguing that valuing justice is the best way to affirm the resolution because if one is seeking truth then they are also seeking justice. Coaches Release #06: “Stoa Policy” (9/10/2018)- In this release authors Vance Trefethen and Chris Jeub review the history of foreign aid and our government’s actions and policies on it as they have developed over the years. Coaches Release #05: “Platform” (9/3/2018)- This week’s Monument Coach Release is the current release for Platform speeches. Coaches Release #04: “Parli” (8/27/2018)- This week’s Monument Coach Release is the current release for parliamentary debaters. Coaches Release #03: “Dramatic Interp” (8/20/2018)- This week’s Monument Coach Release is the current release for our Literary Interpretation (“Interp”) category. Coaches Release #02: “NCFCA Lincoln-Douglas” (8/13/2018)- This week’s Monument Coach Release is the current release for NCFCA Lincoln-Douglas debaters. Lincoln-Douglas Debate is one of the most popular events in NCFCA. Coaches Release #01: “NFHS Policy” (8/6/2018)- This week’s Monument Coach Release includes the current release for NSDA Policy debaters, plus a summary of all the releases we have this week for Members.